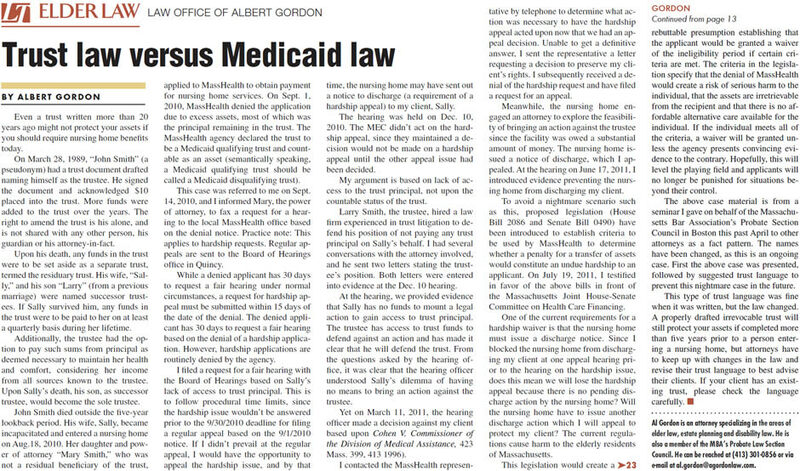 This is from the Courthouse News Service showing why a class action lawsuit has been filed against the Connecticut Department of Social Services. As an accredited Veterans attorney and as an attorney admitted to practice in the United States Court of Veterans Appeals in Washington , D.C., I keep track of cases affecting veterans. Can you trust your trust? Recently, I was speaking to a group at a local Council on Aging about elder law issues on behalf of the Massachusetts Bar Association . We were discussing the different types of trusts when a member of the audience stated" my assets are safe". "My trust , written many years ago has language that states, if I ever have to apply for government benefits, none of the trust assets can be accessed." Unfortunately, this is not true today . Read more: Can you trust your trust?